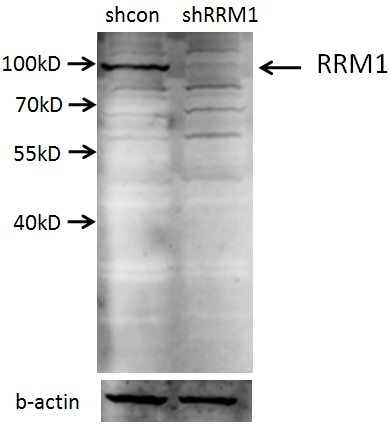 A549 cells (shcontrol and shRNA of RRM1) were subjected to SDS PAGE followed by western blot with 10526-1-AP (RRM1 antibody) at dilution of 1:2000. IP Result of anti-RRM1 (IP:10526-1-AP, 5ug; Detection:10526-1-AP 1:800) with K-562 cells lysate 8000ug. 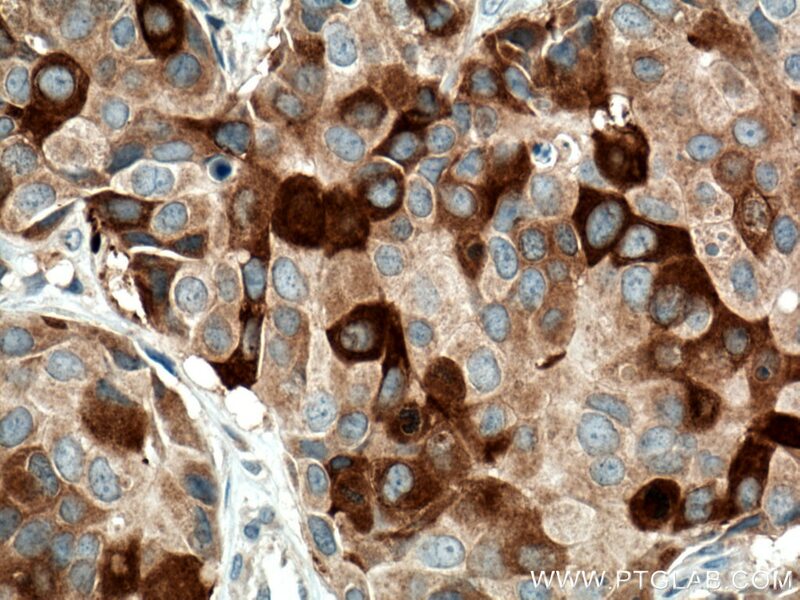 Immunohistochemical analysis of paraffin-embedded human breast cancer tissue slide using 10526-1-AP (RRM1 antibody) at dilution of 1:200 (under 10x lens) heat mediated antigen retrieved with Tris-EDTA buffer(pH9). 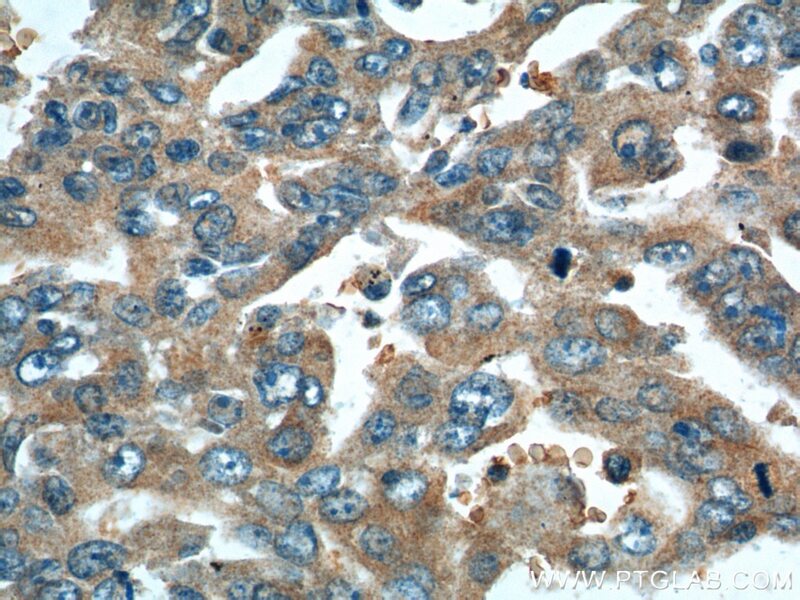 Immunohistochemical analysis of paraffin-embedded human breast cancer tissue slide using 10526-1-AP (RRM1 antibody) at dilution of 1:200 (under 40x lens) heat mediated antigen retrieved with Tris-EDTA buffer(pH9). 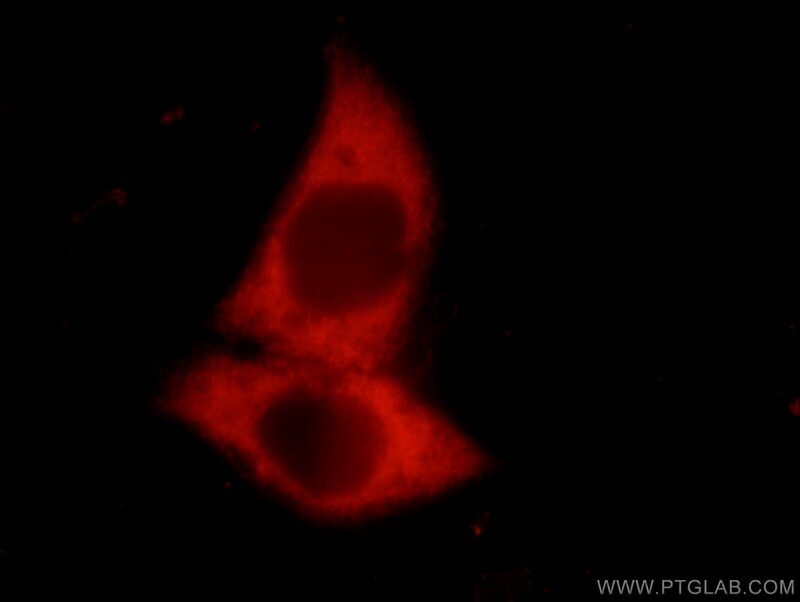 Immunofluorescent analysis of Hela cells, using RRM1 antibody 10526-1-AP at 1:50 dilution and Rhodamine-labeled goat anti-rabbit IgG (red). Blue pseudocolor = DAPI (fluorescent DNA dye). 1X10^6 HeLa cells were stained with .2ug RRM1 antibody (10526-1-AP, red) and control antibody (blue). Fixed with 4% PFA blocked with 3% BSA (30 min). Alexa Fluor 488-conjugated AffiniPure Goat Anti-Rabbit IgG(H+L) with dilution 1:1000.
synthesis necessary for DNA synthesis during the cell cycle as well as during DNA repair. What is the molecular weight of RRM1? subunits in non-dividing quiescent cells (PMID: 17416930). What is the subcellular localization of RRM1? RRM1 localizes to the cytoplasm, where it is responsible for dNTP production, forming a complex with RRM2. However, RRM1 can be recruited to DNA damage sites in the nucleus via interaction with Tip60 (PMID: 20159953). What is the tissue expression pattern of RRM1? How is RRM1 expression regulated during the cell cycle and upon DNA damage? Rrm1 gene expression levels depend on the cell cycle, and the highest mRNA levels are observed in S phase. 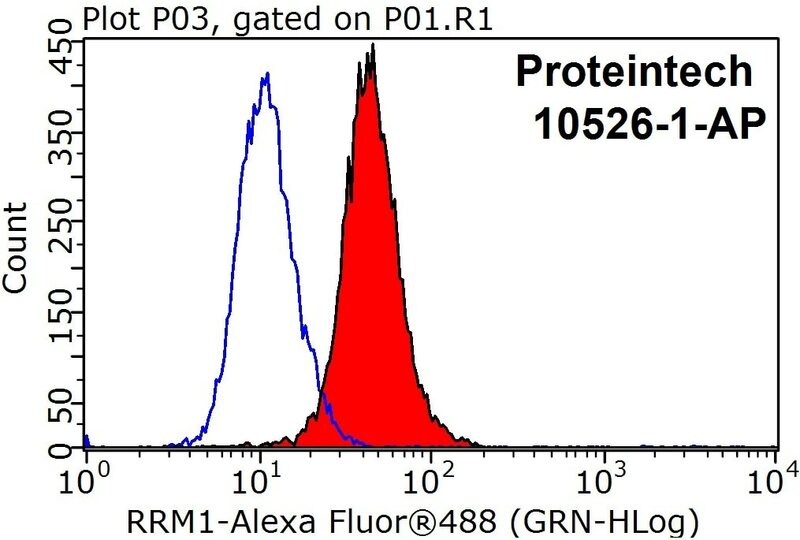 or UV light, expression of RRM1 and RRM2/p53R2 is upregulated (PMID: 1551913 and 8798592). Deoxycytidine kinase expression underpins response to gemcitabine in bladder cancer. Ribonucleotide reductase large subunit M1 predicts poor survival due to modulation of proliferative and invasive ability of gastric cancer. Response to First-Line Chemotherapy in Patients with Non-Small Cell Lung Cancer According to RRM1 Expression. Cell-based Delivery of dATP Via Gap Junctions Enhances Cardiac Contractility. Immunohistochemical Comparison of Biomarker Expression in Biopsy and Surgical Specimens of Non-small Cell Lung Cancer. Molecular Profiling of Infiltrating Urothelial Carcinoma of Bladder and Nonbladder Origin. 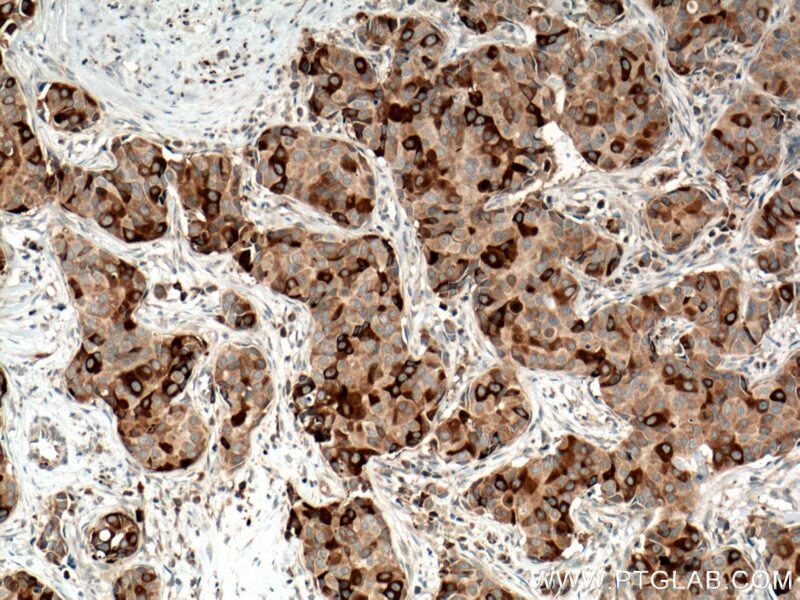 Immunohistochemical analysis of paraffin-embedded human lung cancer tissue slide using 10526-1-AP( RRM1 Antibody) at dilution of 1:200 (under 10x lens). 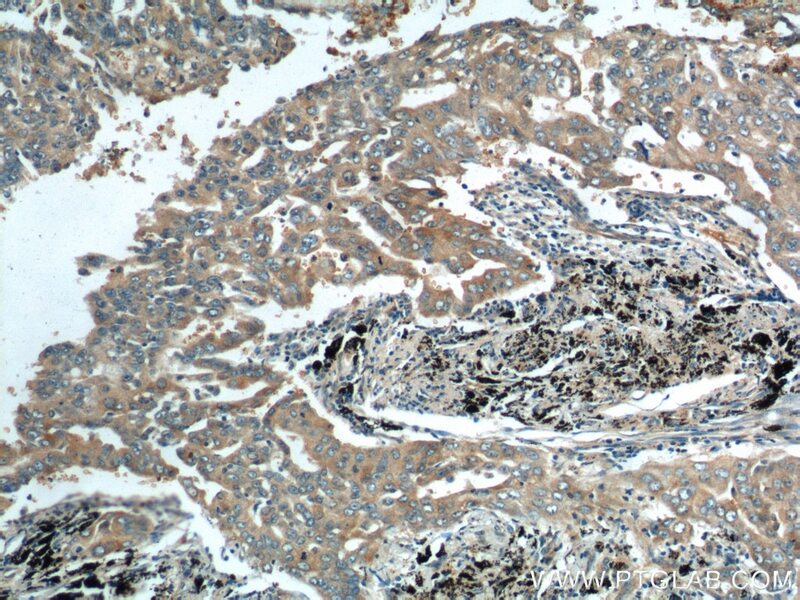 Immunohistochemical analysis of paraffin-embedded human lung cancer tissue slide using 10526-1-AP( RRM1 Antibody) at dilution of 1:200 (under 40x lens). 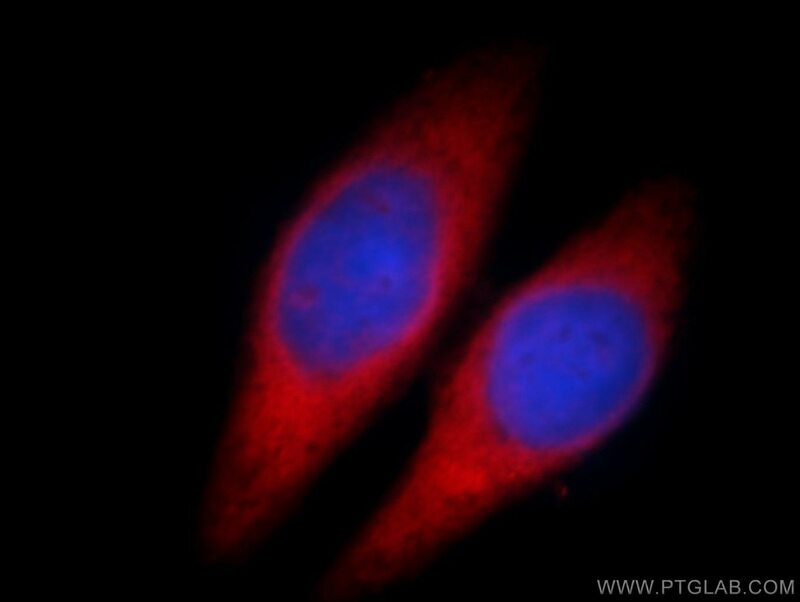 Immunofluorescent analysis of HepG2 cells, using RRM1 antibody 10526-1-AP at 1:25 dilution and Rhodamine-labeled goat anti-rabbit IgG (red). Blue pseudocolor = DAPI (fluorescent DNA dye). 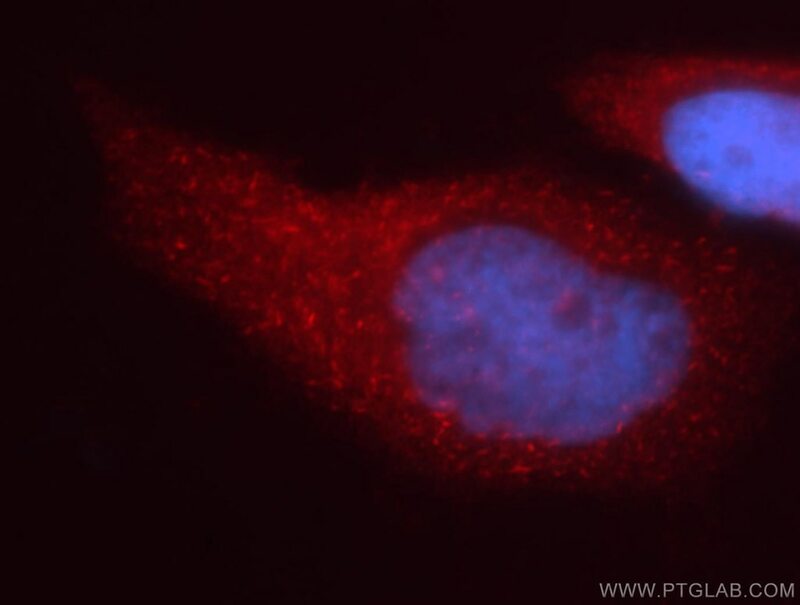 Immunofluorescent analysis of MCF-7 cells using 10526-1-AP(RRM1 antibody) at dilution of 1:50 and and Rhodamine-labeled goat anti-rabbit IgG (red).